Spotted the sulphur crested cockatoo in the gardens today. 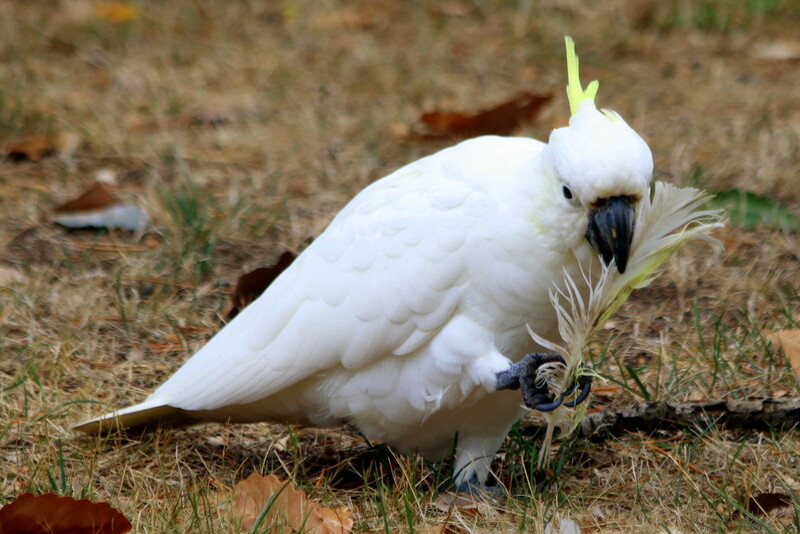 So is he a cannibal trying to eat his mate;s feather? Ha ha ... funny and cute shot! Goodness me, they will eat everything and anything! Well spotted. As long as its only the feathers he's eating! Nice shot! They will chew on just about anything won't they! Cute shot. Not much to eat in those feathers. Perhaps he is preening them with the intention of putting them back. Maybe he’s brushing his beak. Lol. Lovely capture. A beautiful bird and shot! A beautiful close up of this beautiful bird. Great capture perhaps he is confused. He's very cute, but hopefully not a bird-eater.